Do NOT combine "Stan Berenstain" with either "Jan Berenstain" or any of the various "Stan & Jan Berenstain" pages. They are two separate people. Thank you. Our World School Homeschool Book club will read Stuck by Oliver Jeffers and Berenstain Bears: We Fly Kites. We will make super easy, fly-ready kites, have refreshments and fun! See you there! For information on Our World School visit: http://www.meetup.com/Our-World-School-Homeschool-Co-op or email Barbara at: bjohnson_87112@yahoo.com. This bookclub suits ages 4 to 8, but all are welcome to join! Holiday Book Drive Through December Only! Today is Stan Berenstain’s birthday and we will celebrate with cupcakes and some of our favorite Berenstain Bears tales. Stan Berenstain is currently considered a "single author." If one or more works are by a distinct, homonymous authors, go ahead and split the author. 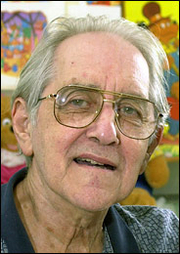 Stan Berenstain is composed of 10 names. You can examine and separate out names.